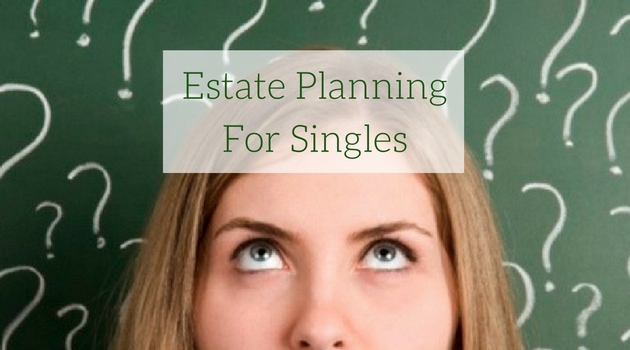 16 Aug I’m Single, Why Do I Need an Estate Plan? While discussions for estate planning often focus on married couples, estate planning for a single person is equally as important. In many instances, a single person will need to do things differently and the consequences of not having a well coordinated plan can sometimes create issues in the future. For married couples and parents, estate decisions are usually routine: the surviving partners and the offspring will receive the passed down money and assets, along with legal and medical authority. Similar to the married individual, a single person is likely to own assets of their own. However, since this individual does not have a spouse, the distribution of wealth is not always a clear cut decision. A financial expert can help alleviate the stress of these decisions by providing their professional advice to help you transition your wealth seamlessly. What is important to understand is how these varying assets are titled, will decide who will get control of the assets and how they’ll be distributed at the time of the individuals’ death. And what is more important to understand is if you don’t have a plan in place at all, you lose control over how your wealth is transitioned after you pass. Beginning your estate plan as a single person or a married person, sooner rather than later is always recommended. Your will is the centrepiece of your estate plan, this is where you are able to distribute your wealth and assets as you see fit. Along with many other working parts, a successful estate plan will fulfill the individual’s wishes and transition their wealth with tax efficiency in mind. This is why working with a trained professional or a trusted advisor is highly recommended when planning for your estate at death. If you don’t have an estate plan that speaks to your asset transfer, business and financial decisions or overall health care directives, meet with a financial advisor that will help you craft a comprehensive plan tailored to your individual needs. At Kemp Financial Group we are here to help! We provide sound financial advice and expert financial services, that will help grow, protect, and transition your wealth in the most tax efficient way possible from one generation to the next.